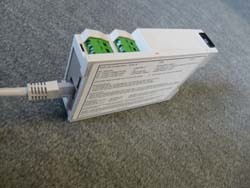 which is connected to a pulse generating kWh meter and to internet via router (LAN or WLAN or 3G router). at the 2GB micro SD card of the iBOX-2S. Moreover the recorded values can be send automatically to a server or Cloud. The ONLINE PV kWh meter can be configured for 1 or 3 phase AC systems. Please specify the voltage, current, phases ( 1 or 3), grid system (3 or 4 wire) at order. AC kWh meters with double registration (production and consumption) are also available. More then one mode can be active in one system. For cumulative counters the iBOX is counting pulses also when the power is disconnected and keep the values. interrupted the values are not lost! The calibration can simply be carried out in advance via software by entering a "pulse- value"
max 6 pcs with 12 Bits Counter OR max 3 pcs with 24 bits non volatile counters. Even additional remote control (iP switch) and alarm options are possible. UTC/GMT time synchronisation of the systemj is also possible. Ask our application engineers for the possibilities! or via e-mail to your PC. is also possible. Simply copy and paste some html code or make a link to the page. The kWh values can also be read over the internet using the built-in webserver by using your browser. The webserver is remote to access over the internet, using port forwarding in the router.